This is a 12″ to 28″ tall, erect, perennial forb that rises on a single stem from a short taproot, fibrous roots, and slender rhizomes. The stem is erect, round, and unbranched below the inflorescence. It is sparsely covered with white, downward-pointing hairs, becoming almost hairless with age. 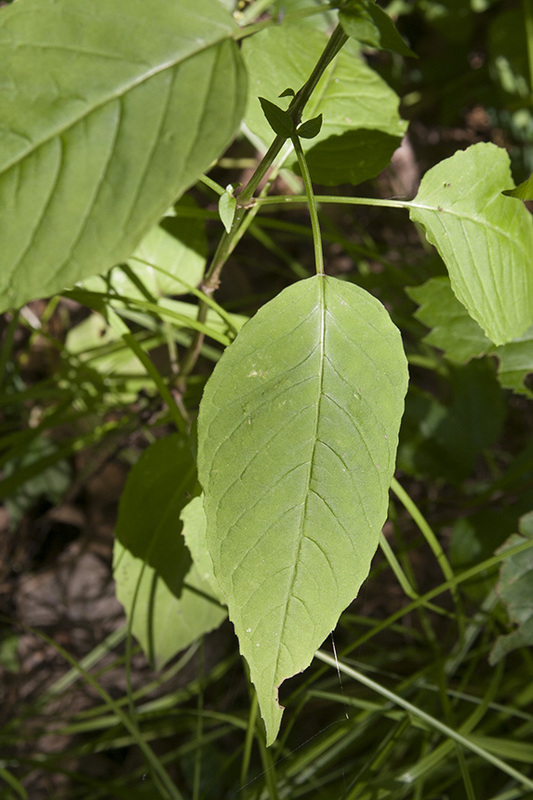 The leaves are opposite, oblong egg-shaped, 2⅜″ to 4¾″ long, and usually less than half as wide as long. They are on leaf stalks (petioles) that are up to 2″ long. 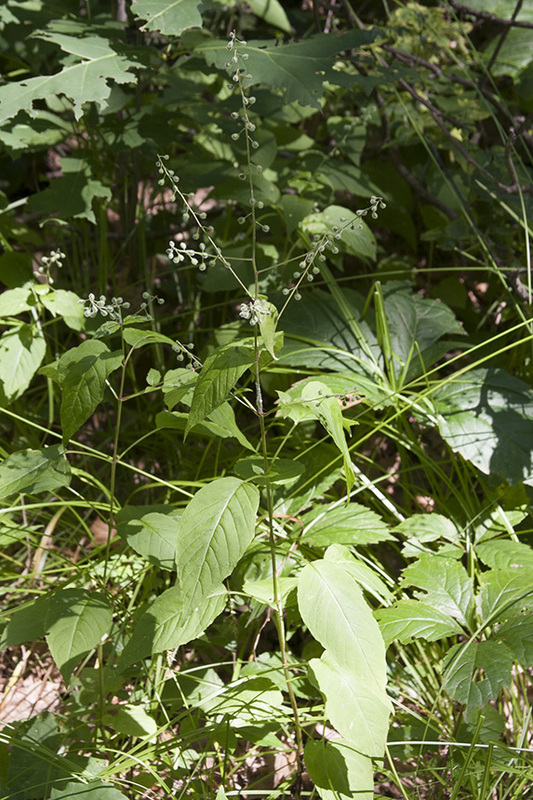 The petioles are round and have a slender groove on the upper side. They are hairless or sparsely covered with forward pointing hairs. The leaf blades are rounded or shallowly heart-shaped at the base and taper to a point at the tip with concave sides along the tip. The upper and lower surfaces sparsely hairy. The margins are very shallowly toothed. The teeth have a minute, whitish tip. 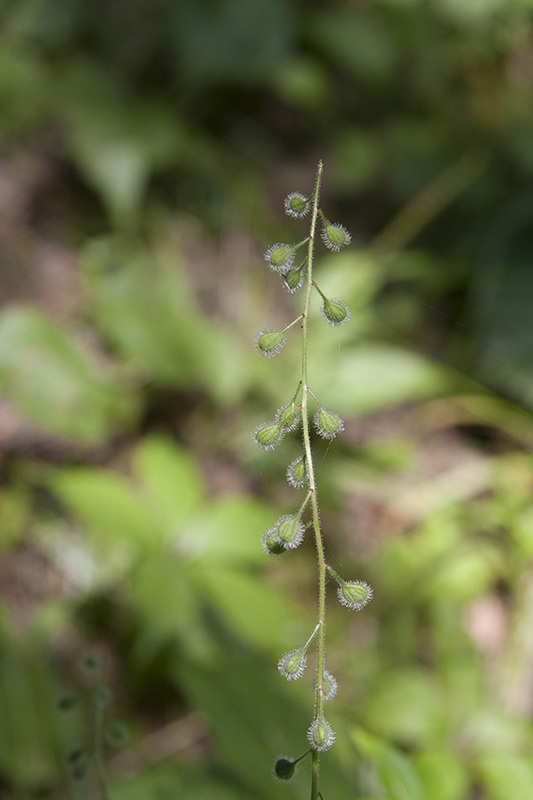 The inflorescence is an unbranched, up to 8″ long cluster (raceme) of many flowers at the end of the stem and shorter racemes rising singly from the axils of bracts near the base of the inflorescence. The central axis of the inflorescence (rachis) elongates early in the season, so that the flowers are widely and evenly spaced along its length. The rachis is moderately to densely covered with spreading, gland-tipped hairs. Each flower is held at the end of a ⅛″ to ⅜″ long, widely-spreading, glandular-hairy stalk (pedicel). At the base of the flower there is a globular, green ovary. The ovary is densely covered with long, hooked hairs. 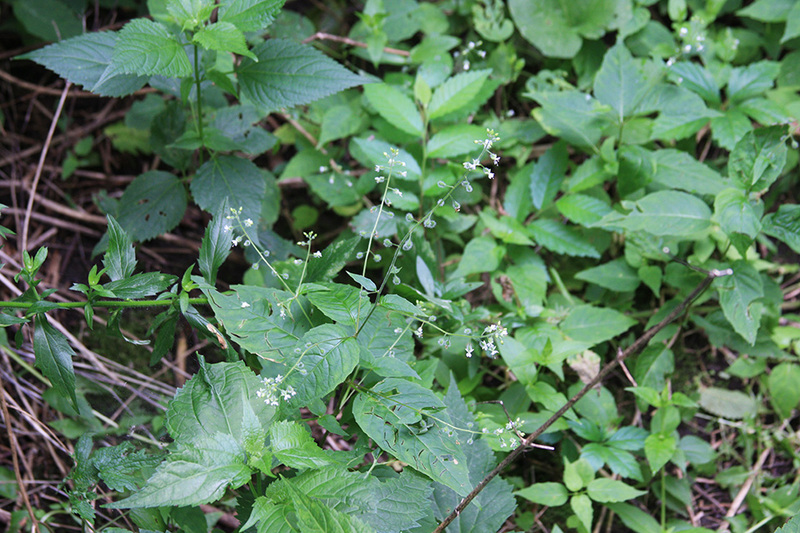 There are 2 green sepals, 2 white petals, 2 white stamens with white anthers, and a long, slender, white style. 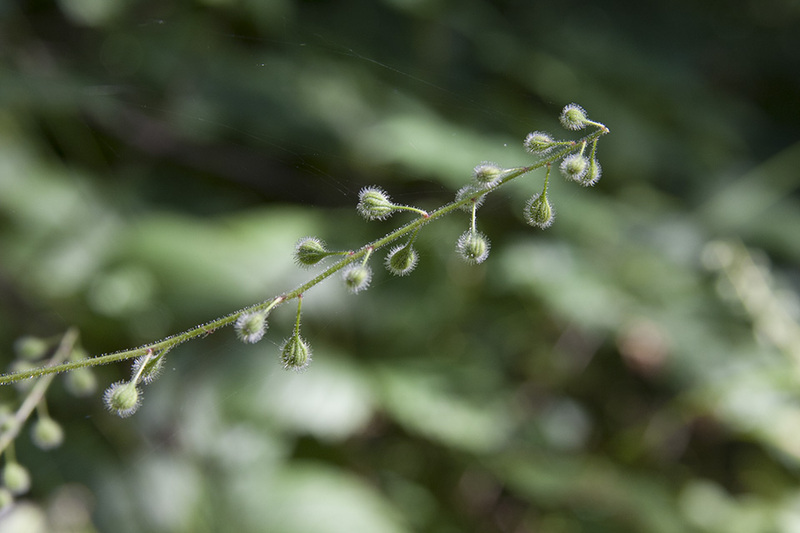 The sepals are 1 ⁄16″ to ⅛″ long, sharply bent backward, glandular-hairy on the outer surface, and hairless on the inner surface. The petals are 1 ⁄16″ to ⅛″ long, spreading, and deeply notched at the tip, the notch less than half the length of the petal. The fruit is a ⅛″ to 3 ⁄16″ long, 2-celled capsule. The capsule is strongly ridged and densely covered with stiff, hooked hairs. 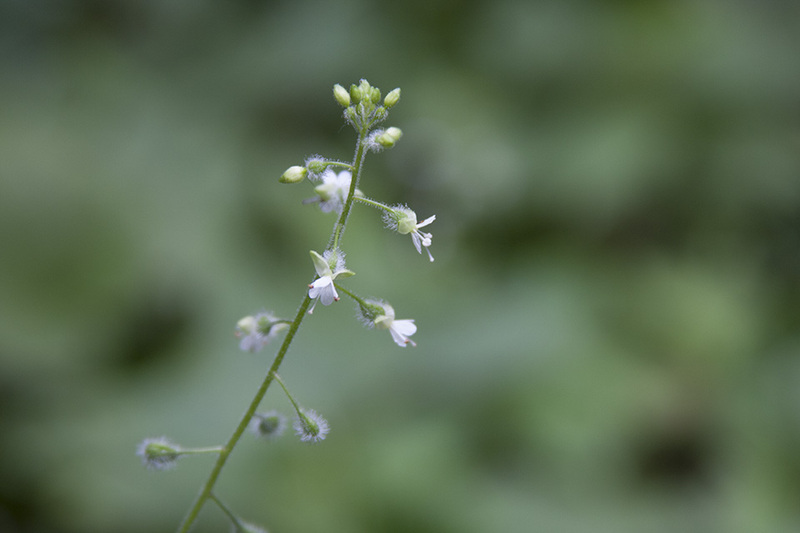 Alpine enchanter’s-nightshade (Circaea alpina ssp. alpina) is a smaller plant, no more than 12″ in height. 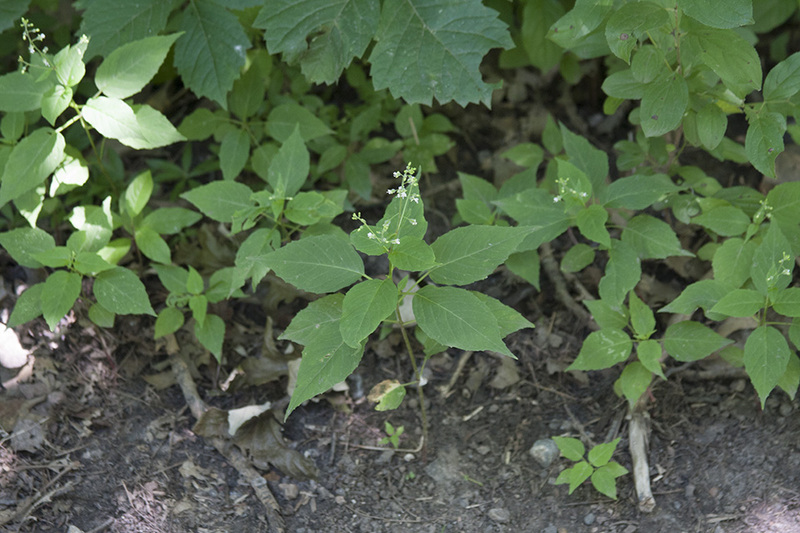 The leaves are usually more than half as wide as long. The flowers are clustered at the end of the raceme. The pedicels are erect to ascending and hairless. The fruit capsule is not ridged. 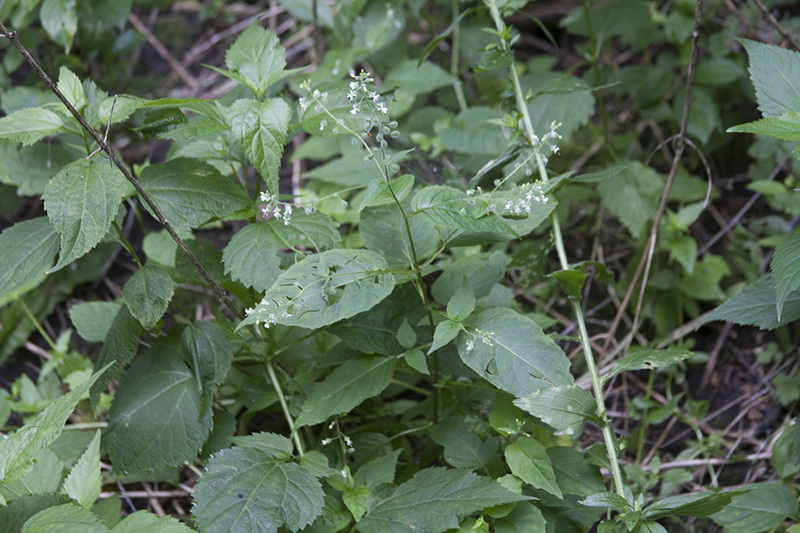 Circaea lutetiana (enchanter's nightshade) is a plant in the evening primrose family, Onagraceae. Groot heksenkruid (Circaea lutetiana) is een vaste plant uit de teunisbloemfamilie (Onagraceae).